Enlightened Equitation is a unique and logic approach to the teaching of riding and humane training of horses. During this 1-2 days course we will be focusing on how to get a correct, elegant seat that works with the horse instead of against it. How to apply the aids so that they are clear to the horse but not obvious to the onlooker and how to apply them in a way that works with the biomechanics of the horse. We will also be focusing on how to synchronise our movements with the horse, how to get the right timing and feeling so that we reach the goal a relaxed, willing happy horse. This short course gives you the opportunity to get a quick look at Monty’s workingmethodes and Equus the language of the horse. If you are considering participating on other courses this is an excellent way to start. The course includes basic theory, demonstrations and practical exercises. 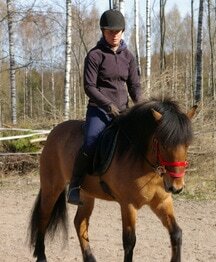 In the end of the day you will have the possibility to experience a guided Join-Up® with your horse. During this Join-Up® two days course you will have the possibility to get a more in dept knowledge about Monty Roberts’s workingmethodes and Equus the language of the horse. 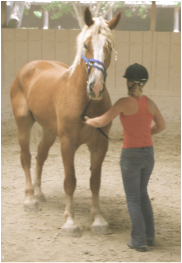 You will learn through discussions, demonstrations and several practical sessions how you can read your horse and communicate with it by using your body language, your eyes and your energy. You will have the possibility to feel the “magical moment” the moment of Join-Up when the horse decides to come to you and be part of your heard. This two day course consists of both theory and practical sessions. We will go through why double line longing is recommended instead of single line longing. By longlining in the right way you will help the horse to balance himself better and prepare him both physically and mentally for the next step in the training. It doesn’t matter if you are a professional rider or an amateur, longlining is a great exercise and variety in the normal work for your horse. Come and learn simple and effective tools how you can improve your horse’s ground manners and make your bond stronger. You will discover where your personal boundaries with horses are and how important it is to be a fair and consistent leader. During the day you will also learn how to use the Dually halter in the correct way. The day consists of discussions, demonstrations and plenty of hands on experience. The goal of the day would be to create a happy horse that willingly follows you wherever you go. The courses mentioned above suites all people interested in horses and all horses no matter what age, breed or discipline they belong to. Interested in a course? maybe there is a few others as well in your stable? I’m happy to come and teach. Private lessons and tailor-made program also available upon request. Please contact me for current price information and availability, depending on travel distances where in the world you are situated.